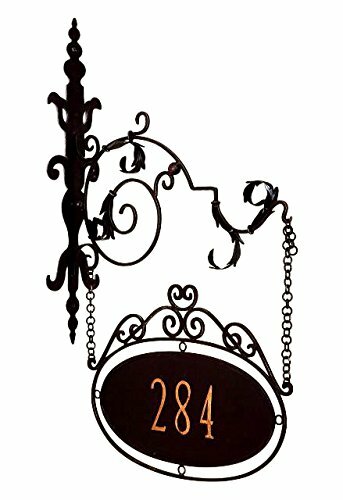 Our personalized plaque is the perfect sophisticated way to display your house number. With a scrolling vine motif that evokes Parisian architecture, it has an open acanthus leaf design. The hand forged metal is hand finished in heavily distressed aged brown and gold. You choose up to 5 numbers for the central plaque - each is 4'' and finished in Italian gold. It is a breathtaking and imposing piece, with the classic design and attention to detail that you would expect from a high-end luxury boutique. Please note that this piece will have the same number on both sides. Properly weighted hanging hardware is attached. Can be used indoors or outdoors. Please email us to specify desired display number (1-5 digits). Please note that personalized items are not returnable, but we will replace them if they arrive damaged or defective. Handcrafted of iron and tole. Use indoors or outdoors. Hand finished in dark brown with gold highlights. Bracket has holes for easy mounting with screws (not included).